San Diego residents will have the chance to weigh in on the three proposed routes for the California High-Speed Rail line that is expected to run from Los Angeles to San Diego by 2019. The state is planning to construct a high-speed train that will ultimately run from San Francisco and Sacramento to San Diego and perhaps include a stop at Lindbergh Field. The railroad line is being planned in eight segments by the California High-Speed Rail Authority with input from regional planning groups. Three meetings will be held, on Oct. 13, 14 and 15, for the public to comment on the three proposed routes that will stop in University City and then continue Downtown. The meetings will feature various information booths — rather than a lecture presentation —to discuss environmental issues, stations, the process and so on. The elementary school of Ocean Beach is celebrating its centennial next year. To honor that occasion, the school is calling on all its alumni to join them in this years Holiday Parade. The goal is to have a Birthday Cake Float, and if need be, have our younger alumni pushing any older alumni in any mode possible. OB Elementary will also have a booth set up in the Funzone selling all Logowear, etc. The Chair of the event is Jeff Fagan. Should this tree be cut down? 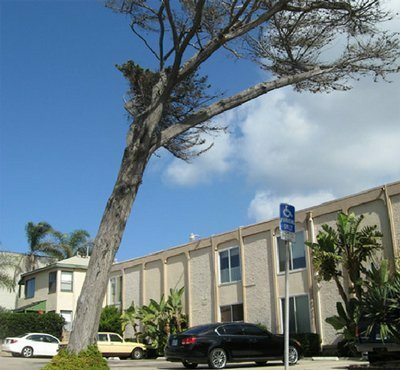 The Union-Tribune’s “Just Fix-it” column reported that the City of San Diego has determined that this Monterey Cypress on Del Mar Ave is dying and is ready to be cut down. Do you agree? Local residents are fearful that if the tree falls, it will damage local cars – as a similar tree did across the street earlier this year. Go check it out. Here is the link to the U-T article on signonsandiego.com. Hodad’s, probably OB’s most famous restaurant, is having a benefit for OB Elementary School on Thursday, October 22nd. In honor of the school’s centennial, from 11 am to 9 pm, Hodad’s will donate 25% of its sales to the school. The restaurant is also asking customers and other members of the community to drop off items that can be donated to the school. Items such as gift certificates, retail items, dinners, free or discounted treatments and tickets can be dropped off at Hodad’s, located at 5010 Newport Avenue. At its next Annual Awards dinner the OB Mainstreet Association will be giving the OB Rag a “Special Award”. Members of this website will graciously accept and do a live blog session during the actual award ceremony. This will be the first formal award that this website has received since our inception two years ago. One of OB’s local anti-graffiti activists, Ed Baier, reported that on Wednesday, October 7th, three days had gone by with no graffiti seen along Sunset Cliffs from Pt. Loma Ave to the OB Pier at Niagara. Hopefully, none has appeared more recently. Our community has Ed and other such activists to thank for their diligence in keeping our cliffs graffiti-free. It only takes a second and they only ask for your name and phone (phone not required). Apple Tree’s address is 4949 Santa Monica Ave. If they get enough complaints, they will have to start maintaining their building. It’s a total mess right now. Above Sunset Cliffs by Ken Goldman. Local artist Ken Goldman has completed a spectacular painting of Sunset Cliffs. Copies of the painting are being sold to benefit the Sunset Cliffs Natural Park Council by having a portion of the purchase price donated to the Council to used for the implementation of the Sunset Cliffs Natural Park Master Plan. There are various sizes available for purchase . Please contact Ken for more details. If you have noticed of late, our right sidebar has new logos and ads of our sponsors. Please support those who support us. And tell them they you saw their logo on the OB Rag. It will impress them. And us. OB Elementary PTA is running a recycling program to assist them in raising funds for the school this year. Please look through the list of everything that they can accept, and bring in your donations to OBE or they will pick up locally on the peninsula! On Halloween, Peoples will have a great event for kids at the store. The “Healthy Halloween” will be from 3 to 5:30 pm. For more info, call 619-224-1387. On October 31st, the OBTC, Dog Beach Dog Wash, and the City’s Environmental Services are sponsoring a community clean-up and recycling day. Get rid of those old appliances, old electronics and that other junk that you’ve been storing in the garage or back yard. Check out this pdf document to what’s recyclable and what’s not, plus other details, like where to take your junk. The OBTC meets next on Wednesday, Oct. 28 at 7 p.m. at the Masonic Center, 1711 Sunset Cliffs Blvd. 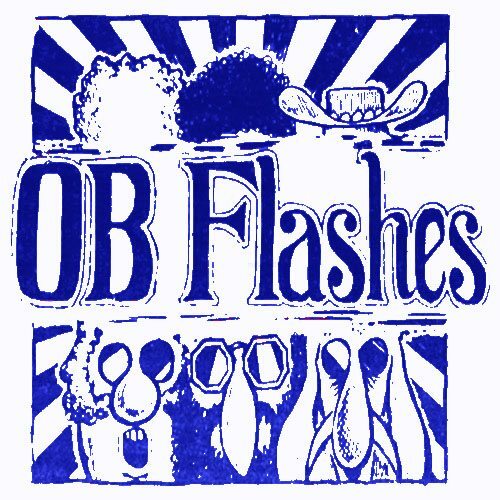 I appreciate OB Flashes even if no one else does. Lots of little items that would be missed during the busy, normal course of things. Molly – ah, thanks for your support. But these OB Flashes just went up, and plus it’s a beautiful day and we really don’t want people sitting at home (like us) and being on their computer in the middle of a gorgeous day. Besides there’s Oktoberfest. And then Lane is taking the GRE – good luck, dude! You’ll do well, we know. And then Jon is taking off on a cruise with future in-laws. Keep your lifejacket on at all times! Mary is busy waitressing and trying to pay bills by writing for others. Dave’s got twelve gigs this weekend alone. Gary’s got a business to run, Patty has a neck collar on, Frank has to do work that brings in money, Anna is planning our counter-attack on the fundies, Wireless is cleaning his apartment for our upcoming monthly meeting, Ernie is pondering the next step, … but Doug, PSD and maybe Jon are at the Oktoberfest and hopefully will be filing a report with lots of photos soooooon. Stay tuned. ugh…can we please not import every douche-bag from PB to our event in the future? That beer garden was a nightmare. Last year was way more local, way more fun. As you may have heard, the Westboro Baptist Church is coming to San Diego on OCTOBER 16th to spread their words of hate with those who have no interest or desire to hear it. If you do not know who these people are please Google them to find out what they are all about. The church’s “Quit Telling Kids it’s OK to be Fags” demonstration will take place from 2:10 P.M. – 3:00 P.M at San Diego High School. I am proposing that we are there armed with our voices and any other musical instrument – be it a guitar, drums, flute, whistle, kazoo, banjo, tambourine… anything that is used to make noise! If our love is loud enough their hate will be silenced! PLEASE, if you are interested please contact me and I will keep you updated as this progresses! We are there to support those who are being targeted. We do not want to argue with anyone from the Westboro Church or their supporters for if we do so our message of love and tolerance will become contradicted. Violence is not an option. If everyone is positive there is no way we can not be heard. Why are these protests always so early? Don’t these baptists have jobs? At PL United Methodist Church, 1984, Sunset Cliffs Blvd., O.B. Historic Designation Report in order to qualify your home for Mills Act status and a reduction in property taxes. A template for Historic Reports and a Step by Step guide will be available free to anyone who would like to research their home for possible historic designation. We urge all groups and individuals opposed to the war in Afghanistan (soon entering its ninth year) to join us on October 16. If your group would like to endorse the demonstration, please let us know by contacting the SDCPJ at aka0001@thotmail.com. Decide on your own slogans. Bring your own signs and banners. Bring your friends, fellow students, and coworkers. Be there on October 16. Hey – check out 2 things: our new all-black OB Rag T-shirts – and all our new sponsors and advertisers on the sidebar. Ch 10 reports that an OB Woman was just arrested Wed for ahit-and-run on Sunset Cliffs and former councilmember Michael Zucchet witnessed it and led police to her home. A 24-year-old woman was in custody Wednesday on suspicion of drunken driving and hit-and-run after allegedly striking a 16-year-old boy on a bicycle with her car near Sunset Cliffs. The teen was struck shortly after 5:30 p.m. Tuesday while riding in a bicycle lane, according to San Diego police. 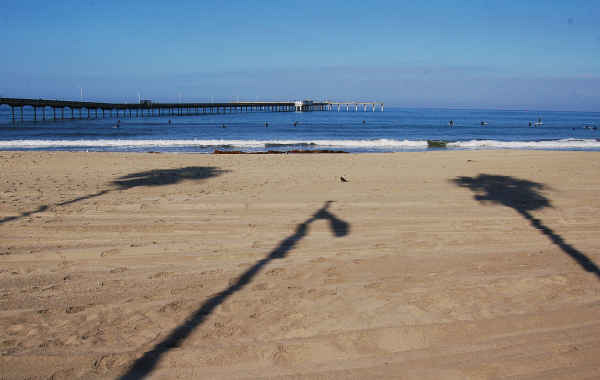 Don’t forget the 24th Annual Pier Pancake Breakfast coming up this Sunday morning on the OB pier! It is a great cause and all the proceeds go to the OB Christmas Parade, Tree and Food and Toy drive! 7:30 am to 11am; Adults – $10, kids – $5. It’s hosted by the OB Geriatrics Surf Club. Last year we raised a RECORD amount – over $18K – and helped out over 75 families and 20 community organizations in OB! Hope you can spare some time to come down and have some pancakes or maybe just sip on a Mimosa and enjoy the sun and the ocean! It should be nice out there! I thought the high speed rail got voted down. vote for the OB Rag at the blogger choice awards, PLEASE. it would be so cool if our community blog got recognized here!